Reviewers have been left largely disappointed by the script of Harry Potter and the Cursed Child. Thousands of fans queued at bookshops to get their hands on the West End production's script when it was released at the weekend. Its publication has allowed the play to reach a wider global audience of fans unable to see the sold-out show. But critics complained reading the script was an "incomplete experience" as the story "demands to be seen". One added it was "lacking the richness that acting and staging would add". Written by Jack Thorne and approved by Potter author JK Rowling, the production focuses on Harry and Draco Malfoy's sons - Albus and Scorpius - who travel back in time and set off a domino effect of consequences that radically change the present. On stage, the production received a number of five star reviews when it officially opened last week, with one critic describing it as "a game-changing production". But reviewers commented that reading the script in isolation provided a different experience. Whether encountered on stage or on the page, this trip back into the magical world of Hogwarts is thrilling. One of the most successful things about the live theatre show is its jaw-dropping on-stage special effects. It can be hard to visualise these through stage directions alone: the reader is left wondering how on earth characters visibly become one another, exchange magical spells and transform objects into new things before the audience's eyes. More fundamentally, the stage show's success rests on a combination of plot, performance, direction and sheer spectacle - on the page, the script feels like a skeleton of that overall intended experience. But the emotional climax is devastating even on paper. On stage, perhaps, this would be a delight. To see how JK Rowling envisioned Harry as a 37-year-old man, to see magic turned real by invisible theatre tricks. Reviews of the play all seemed to think so. But as a mere script, where everything besides dialogue is written as bland stage commands ("Albus is sleeping in a pew. Ginny is watching him carefully. Harry is looking out the opposite window"), it feels nothing like the detailed-filled paragraphs of the Rowling we love. It's more like sneaking a peek at her unfinished notes or finding a fetching piece of fan fiction. The magic is stunted. The eighth story in the series goes Back to the Future with disappointing results. The Cursed Child becomes a convoluted time-travel adventure that honestly is a bit of a slog. JK Rowling should be applauded for pushing the boundaries of form. The easiest thing for her to do would have been to just write a new book - or even skip the new book and got right to the movie. The big problem is The Cursed Child is less an original story than a remix of the existing Potter mythology. The been there, done that feeling to the whole thing is its greatest weakness. 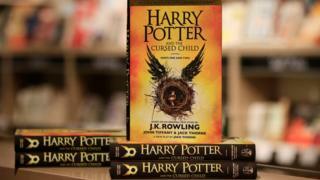 [The] latest Potter instalment should be read for what it is - a play and not a novel. Potter fans expecting Rowling's authorial stamp or the depth of magical and fantastical description that created an entire alternative world for them in their imaginations, will be disappointed with this offering. I would happily join the queue for tickets to the play when the next batch are released to the public for sale, and you would be better off following my lead, saving the €19.99 for some popcorn at the interval. While reading the script is an incomplete experience - noticeably lacking the richness that acting and staging would add to a realised production and the familiar Rowling prose a novel would have contained - it may capture just enough of the old Potter magic to please even the most sceptical of fans. As a script only, it takes a little too long for Cursed Child to draw a reader in. The stage directions, though cheeky and fun at points, are overly vague, leaving much to be desired in descriptions of setting and action scenes. Without actors behind them, unestablished characters feel flat and underdeveloped. The introduction of primary protagonists Albus and Scorpius is, largely, perfect. Both characters immediately spring from the page and stake their claim as the wizarding world's greatest new (yes, new) creations. One wonders what Rowling would have done had Cursed Child manifested itself in her home medium, with her inimitable mode of description guiding readers rather than leaving them to fill in the acting blanks in their vision of how this piece operates on a stage. It is not actually a novel, but a play script, which may annoy some people expecting a Harry Potter adventure in the typical format. When it comes to the plot, it is harder to form an understanding of what exactly is going on because it really is written to be viewed live in a theatre. I enjoyed the plot, but I may have thought better of it in the form of a novel. I don't feel it deserves the title of the eighth Harry Potter book. Overall, it is worth a read if you are interested in Harry Potter and have read all the other books in the series. In any other case, I believe it isn't really worth it.